200 Inning & 254 K’s ? If Baseball is 90% pitching and starting pitching represents about 70% of the hurling, then it must be so that the AL East, the best Division in MLB, will be won by the guys who take the mound in the first inning. But which AL East team has the clear edge after the first 2 weeks of play? And which starters represent the best of the best? Surely Cobb, Tillman, Tanaka, Kuroda, Pineda, Lester, Lackey and Peavey are presenting their teams with the most quality starts and/or dominating performances. Those are the contenders for top AL East starter of 2014 so far. If the season ended today and Boston & New York went to the postseason it is a certainty that Kuroda-Tanaka-Pineda and Lester-Lackey-Peavey would present formidable playoff rotations. Don’t underestimate Tampa Bay’s 3 best starters, Cobb-Archer-Price,. They are clearly 3rd best but Price and Archer are capable of delivering more and probably will. The tasty question is who is the top starter in the Division. Tasty, because the answer is Tanaka. He is distancing himself from the pack in a delightful way if you are a Yankee fan, and at an alarming rate if you are everyone else. 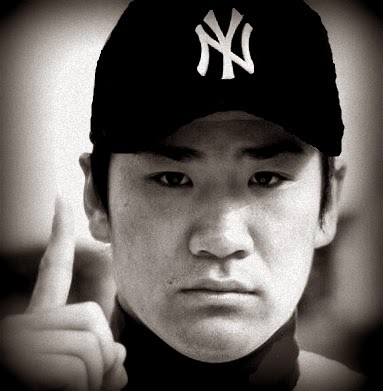 Tanaka leads the Division in K’s, IP, and fewest walks. His ERA is a sparkling 2.05. His strikeout rate per 9 innings is 11.45. That works out to 254 K’s if he throws 200 innings. If you have watched him pitch you know that of not for 1 or 2 mistakes he would have allowed no runs at all. Pretty damn good start to a career, no? Wait a second. There are 2 A-listers who have an even better ERA than Tanaka. Pineda sits at 1.00 this morning. And Chris Tillman is at a breathtaking 0.84. What madness. 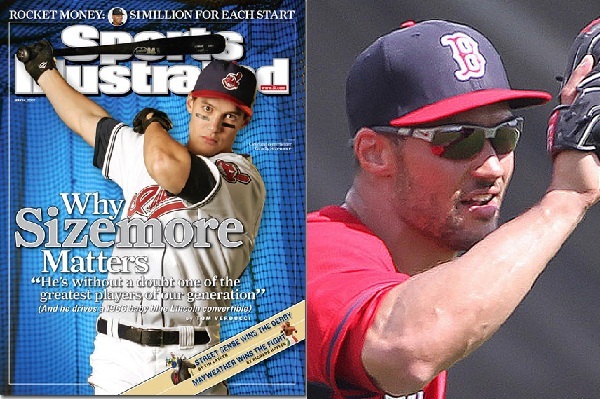 They say that pitchers begin the season more ready than position players but these guys are hotter than hot. Overall, the eight hurlers mentioned here are racking up innings, limiting hits, registering K’s and providing quality starts. They are definitely the best of the AL East so far. Unless you consider Toronto’s Mark Buehrle, who is 3 – 0, 0.86 ERA and a WHIP of 0.90. 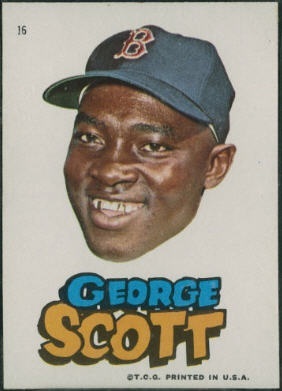 The two things I remember first about George Scott was how smooth he was for a big man when fielding his position……and how much trouble I had understanding the Greenville, MS native when he spoke. At this moment I am thinking of George Scott and I smell Fenway Franks and coconut oil. The skin on my forehead is heating up from the sun and my legs are burning in my blue wooden seat in grandstand 8. I have a little belly and no fear of dying. It is 1970. “American Woman” is playing somewhere and a large black man deftly takes ground balls at first base. His grace defies his bulky build. Inside that 235 pound frame there is a platinum timing chain. He body and mind are perfectly synchronized. I cannot believe how effortlessly he moves his weight, grabbing, pivoting and dashing to the bag. Straight faced. Straight up. That was Boomer. And now we say farewell. 1977 Sox that smashed 32 home runs in 22 games. He won a minor league Triple Crown. He wore the Golden Sombrero, striking out 5x in his MLB debut. His 27 HR’s and 90 RBI as a Rookie placed him 4th in the 1966 ROY voting behind Tommy Agee, Jim Nash and Davey Johnson. At the AS break that year, his stats were .271, 18 , 53. So good that he started for the AL All Stars over Norm Cash. He hit one ball so far off of Whitey Ford at Yankee Stadium that Mickey Mantle estimated the ball would have travelled 550 feet were it to have sailed unfettered. By 1971’s end, Boomer had struck 115 home runs for the BoSox, and been called the best fielding first baseman since Gil Hodges. He was a rock solid cog in the machine. I looked forward to the next decade with him at first. But on Oct. 10, 1971, he was the key man in a 6 player package that went to Milwaukee for Tommy Harper, Marty Pattin and Lew Krause. In 1975, Brewer team mate Hank Aaron coached him on hitting in ways previously unknown to George. He subsequently posted his best offensive stats with .285, 36 and 109. Mr. Scott later returned to the Sox for whom he hit another 49 home runs over less than 3 seasons. He hit 154 HR’s for Boston and 271 total in his career. He would have ranked 5th all-time in HR’s by a Red Sox player had he played his entire career in Beantown. Injuries ended his career in 1979 but he went on to bat .335 and .350 in the Mexican League in the early 80’s. He also managed and coached in the minors until 2002. He leaves behind three sons: a realtor, a high school principal and an athlete. 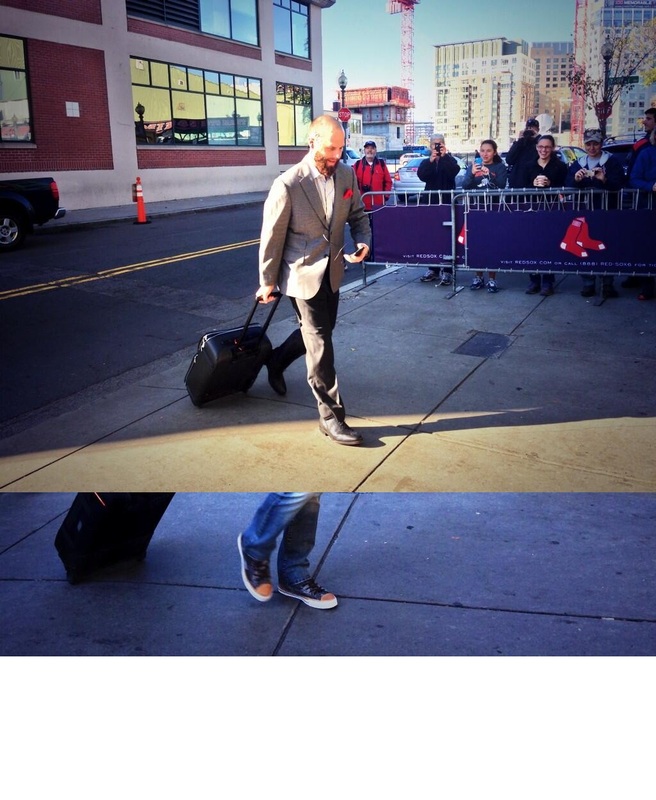 Red Sox fans of a certain vintage will always remember you, big man. You carried a stick of dynamite and a slick piece of leather. Buch is 9-0 and needed. Dogs are sleeping with cats, Rush Limbaugh has a woody for Hillary and the last place Red Sox are 50 – 34. The good guys are owners of the best record in the AL, perched atop the Eastern Division, with Clay Buchholz and Jon Lester a combined 17 -4. What’s more, Papi, Ellsbury and the Muddy Chicken are back from injuries and rocking classic offensive stats. Of course, the closer role is an unmitigated train wreck. Ryan Hanrahan, the closer designate, is out for the year, just as last year’s designate, Andrew Bailey, was lost for that season. But the Sox have found the bullpen to be just good enough in 2013 if they re-designate as they go, from Hanrahan to Bailey to Uehara. With big Sox stars raking it and new role players like Iglesias, Victorino and Gomes adding mojo to the effort, with 50 wins and the top spot…..I SHOULD FEEL GOOD ! Our Sox are riding the coat tails of an 18-8 April and a 5-1 record that closed out June. 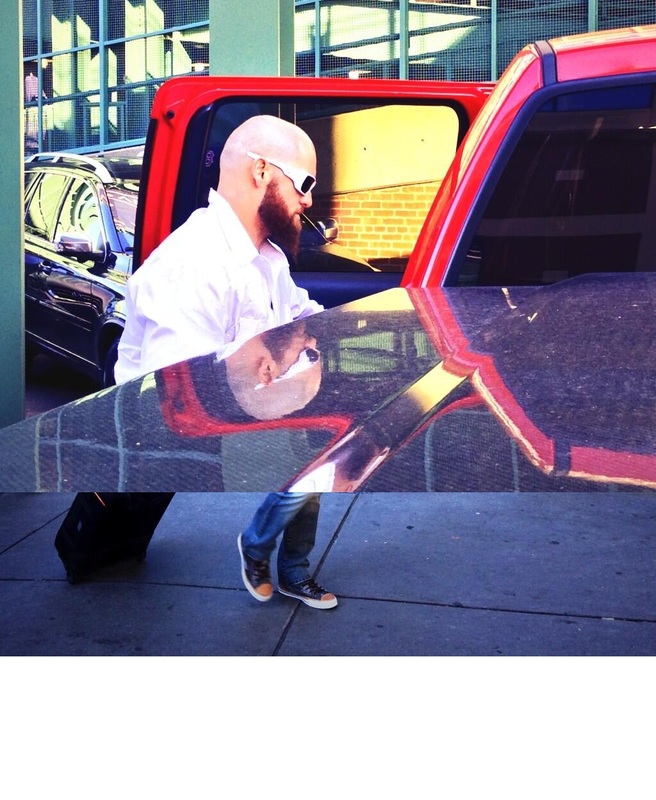 Factor out the 5 excellent weeks of play and the Sox are 27 – 25. You can sense there is a vulnerable underbelly. And it isn’t the offense. Through 84 games, the Sox have scored just (11) eleven runs more than the hapless Valentine Men of last year. What has been different then is the starting pitching. It has made all the difference. In April, the month of all wonderful pitching months, Sox hurlers started 26 games and delivered 15 quality starts, plus 8 more quality-cusp starts in which they yielded 3, 2, 1, or 0 runs and went 5 to 5 2/3 IP. Rounded for simplicity, the Sox starters gave million dollar performances in 23 of 26 starts. With a 3.22 ERA. It’s amazing that the Sox managed to lose 8 times. We are only as good as our starting pitching and once that factor is proficient, we are only as championship viable as our bullpen. The 1969 Mets batted just .242, had only one starter who hit .300 and one who hit more than 14 home runs. 9 other NL teams scored more than Hodges boys that year. The Orioles, champs of the AL, scored 132 more runs in the regular season than the Mets, but superior pitching triumphed in the 1969 World Series. And it always will. Which is what has me worried. Buchholz hasn’t pitched since June 8. Lester hasn’t pitched well since June 6. Lackey has been far better than his 5-5 record indicates. 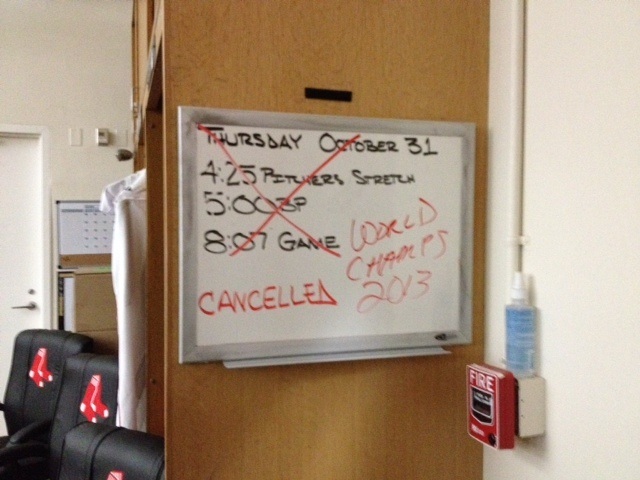 But the Sox won’t make the post-season with a rotation of Doubront, Webster, Dempster, Lackey and Lester. The Orioles have a ton of offense, a brilliant manager and underdog mojo. The Blue Jays are fully capable of blowing by everyone if they keep their pitching going. But we are just 3 laps into a 6 lap race. Bring us more pitching. Bring us a starter, a swing and a closer backup. 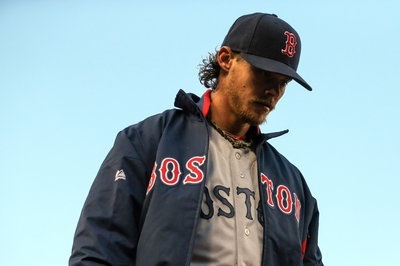 Bring back a healthy Buchholz. Bring it now, Mr. Cherrington. 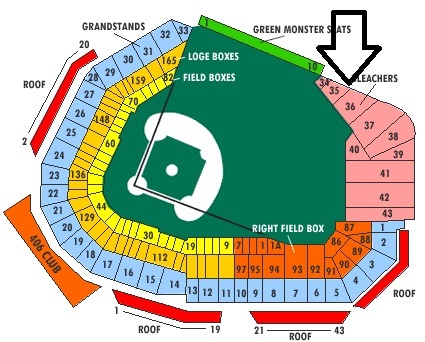 Take a look at where the arrow is pointing in the above seating diagram. Section 35 is Big Papi’s happy place. David Ortiz went 3 for 4 in last night’s 7-2 win over the Astros at Fenway, boosting his 2013 BA to .550 (18 at bats.) Papi continued his current hitting streak with a rbi single in the 1st inning. It is a 17 game streak at the moment. Another sign that we are seeing vintage Papi redux is where he deposited his first home run of the season in the 3rd inning. It landed 6 rows deep in section 35, the straight away center bleacher section that is adjacent to normally canvas covered section. Long time Papi watchers, all 20 million of them, know that straight away center is where David smacks homeruns when his swing is at peak efficiency. 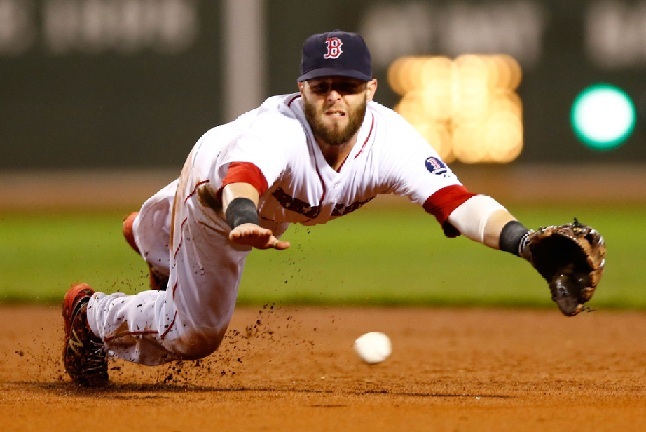 Last week, several boo birds lamented David’s return when the Papi-less Sox were 12 – 4. To them I say SHUSH and strap yourself in for the next few weeks. 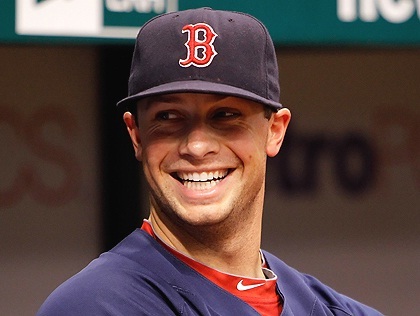 The swinging F Bomber is making Pedroia-Ortiz-Napoli look like the most dangerous 3-4-5 in the American League. Cabrera-Fielder-Martinez, maybe. But I’m putting all my loot on the big guy, the little a** kicker, and scowling Mike. Let’s just hope David isn’t downing any magic milkshakes to keep things rolling at age 37.5. As of this morning, The Astros have the poorest record in the American League. But not by much. They hold small margins over Seattle and Toronto for that ignominious title. The American League licked its collective chops when the woeful ‘Stro’s brought their 55-107 record to the AL West for 2013. BUT — how fair it is to the AL Central and East to provide the A’s, Rangers and the Angels each 17 opportunities to defeat baseball’s losingest team ? The East and Central will face the Space City Weaklings just 7 times each. Hence there is an unfair advantage in the wild card race for the western squads. This is worth watching as the season grinds on. To date, Houston is 5-12 against its division mates, with 4 of those wins coming against Seattle. The Astros haven’t shown much against Texas and the Angels so far and that could be an indication that 2013 will pan out exactly as the East and Central teams feared. Advantage West. At least we have the Astros to enjoy for the next 6 games. 2 more at Fenway and 3 in the Bronx after which they will be welcomed in the Motor City. The 2nd place Tigers will be salivating.